10 steps of installing a game. 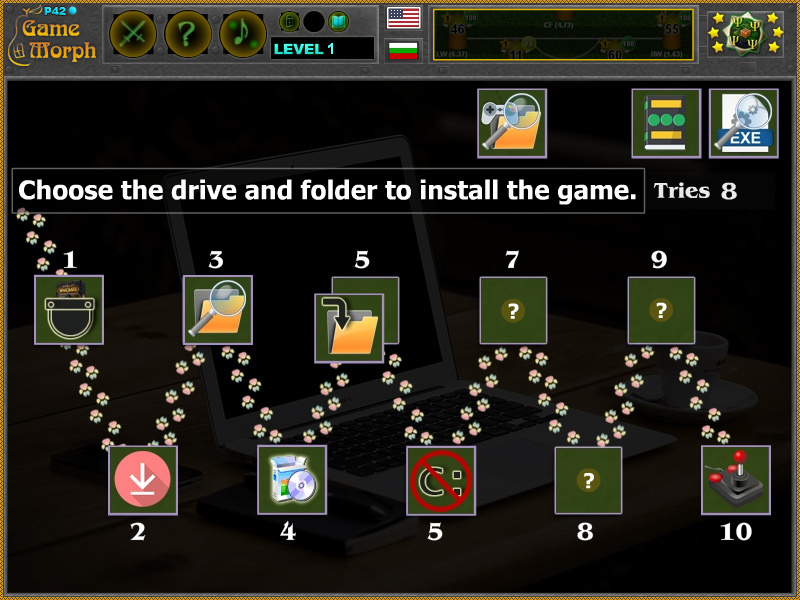 "Installing Games" is a free online knowledge level game to learn how and where to install computer programs. Minute to win it game. Interactive computer technology class for desktop computers, laptops and tablets. Sort the 10 steps to install a game in correct order. Computers learning game, suitable for online classes and interactive lessons. Free online educational game. IT lesson 11s for 8 grade clasroom game. Own a game from Steam or GoG. Choose the drive and folder to install the game. Read what the installer is doing. Find the folder where the game is installed. Find the executable file and run it. How to play Installing Games. There are 10 square pieces at the top of the screen. Every piece represent one step from the installing game walkthrough. Drag and drop them at the empty sockets in the center of the screen in correct order. Sort all 10 steps to win the game. 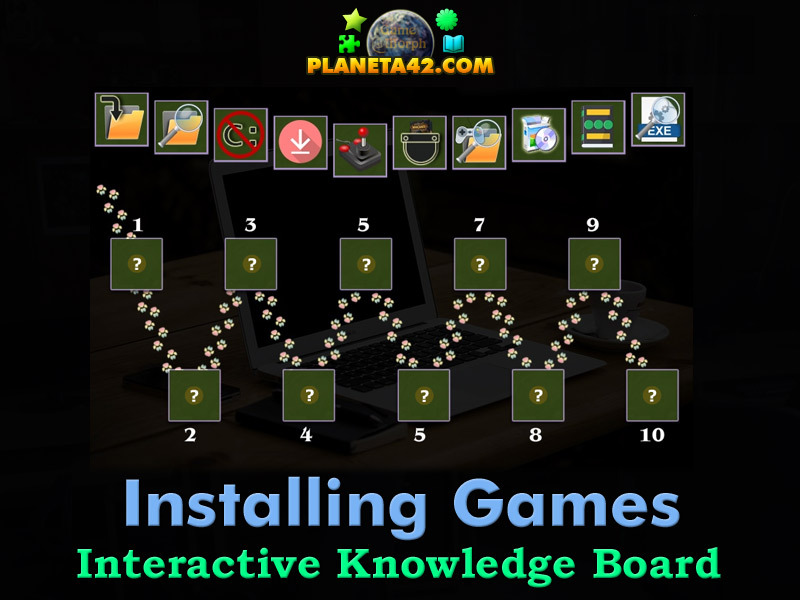 Know basic method to install games and get +1 Knowledge Level. Nowadays installing a game is almost automatical. Some sites, and even the OS themselves offer direct installations, depriving the user of basic knowledge of where the game is and how it is installed. This often leads to many problems afterwards or even failed installations. That's why we need to know what exactly is needed to install a game with this 10 simple steps. They will not apply for every game, but this is just a way to do it, not a rule. So, as always, first we need to own a game, either free or paid. Pirate games from torrents often are cracked incorrectly, for specific computer configurations or have viruses, so be aware. Best way is to get a game from Steam or GoG. 20 years ago the games were distributed on compact discs, but now we can just download them from the vendor. After downloading it, we need to find where it have been downloaded. Modern OS have a download folder by default in My Documents folder, which is very inapropriate as it is filling drive c: with tons of data, which at some point may slow the computer performance and the user is unaware why it is happening. Creating and choosing a folder out of C: is good idea. When we are at the downloaded game folder we usually search for a setup.exe file. After running the file the installation begins. Now we need again to choose a drive and folder where the installed game will be stored. Again not on drive c:, where the games want to go by default. Some games will need additional software to run, so during installation, some more dialogue windows could appear. Read them well and in general accept what they need to do. After installation is finished, most games will ask you to create desktop shortcuts to the game. If not, find the folder where you just installed the game, and look for executable file (.exe) with the game name and a lovely game icon. Drag and drop it with right mouse button to the desctop and choose "create shortcut" option. Now double click and play the game.